Moving can be a daunting task. The whole process will consume a lot of your valuable time and could be risky if not done by a professional mover. Everything from packing to transportation requires expertise. If moving is executed by an inexperienced company, homeowners stand to lose precious property and suffer significant monetary losses. The best way out of such dilemmas is to hire a Wellington moving company, such as Top Notch Movers, with experience moving neighbors in your immediate area. 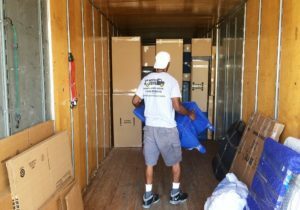 We are a professional moving company that takes care of all the details for you including packing, transportation, and unloading. We ensure a smooth transition for homeowners who are relocating right around the corner or miles away. We save you time, by handling the entire moving process including packing, loading, unloading and organizing your valuables from start to finish. As your Wellington moving company, Top Notch Movers is in-tune to your needs for specialized equipment to move your expensive and fragile property and we provide the necessary care and equipment to assure that these items remain intact throughout the moving process. We save you money. Our prices are reasonable without compromising quality and service. Top Notch Movers is a professional and experienced moving company, and we have your back. As Wellington movers, we love offering our clients exceptional customer service that is unparalleled by other moving companies. Our ultimate goal is customer satisfaction and if you are not satisfied, neither are we. Call us today for a free estimate and quote!